The Globe and Mail reported today that Ontario has decided to take “major steps” forward in addressing the lack of financial literacy that is taking place in our public school system. I have written about this topic before, and it continues to astound me that we are routinely sending students out into the world without a true understanding of how the tax system works or what interest rates are. When I seen the headline I initially thought, “Great, maybe now the other provinces can follow Ontario’s lead,” (this is how it works in the education world, no one wants to be the first to try anything because it’s easier to do whatever everyone else is doing and safely collect your paycheque). Then I read the article and was disappointed if not surprised. In their infinite wisdom, the curriculum gurus that collect well over 100K a year have decided that we should merely “sprinkle” a few financial lessons out over a few different courses. “If you don’t call it ‘financial literacy’ it seems to be quite appealing to kids,” stated Casey Cosgrove, director of the Canadian Centre for Financial Literacy. Why call any subject anything at all. Let’s just allow every student make up their favourite name for a course so that they might suddenly be magically engaged. At this point I am almost starting to believe the whole conspiracy theory that there is a reason why the vast majority of us are not learning the financial basics in high school – so that the rich stay wealthy and elite, and the rest of us go on being consumers and not capitalists. There are so many problems with this program I don’t know where to begin. First and foremost, I am sorry to speak negatively about my colleagues in this manner, but there are many, many teachers out there who don’t know the financial basics (why would they, they would never have been tested on it at any point). Merely suggesting that they include it in courses (it is not a mandatory regulation, only a suggested practice) that they have set in stone for years is not going to change a single thing. Another main problem is the educational idea of “hidden curriculum.” This theory basically states that students learn as much from the structure of the educational system as they do from the raw information presented. For example, if English has its own course, and is mandatory to graduate, then it must be important. What is this telling students about financial affairs? Plainly it can’t be that important since it doesn’t even have its own class. I wrote pretty extensively about the business class I teach to my students as a guest post here. Please believe me when I tell you that our children (or at least 90% of them) do not have a clue about personal finance (never mind any sort of corporate or business finance). This won’t be solved by politely asking if social studies teachers wouldn’t mind teaching a little about how the ancient Egyptians used money. The Globe and Mail correctly pointed out a far superior system used in Utah where they have a mandatory course called, “General Financial Literacy,” that students must pass in order to be able to graduate. My guess is that those students won’t grow up and take out subprime mortgages! What a surprise. If there are parents reading, please take this as an incentive to teach your own children about how to handle credit, invest for the future, and the thousand other little financial tricks one should know when they go into the working world. Sorry, our school system has decided that it will be effective to “sprinkle” a little dash of it here and there, but we don’t feel confident enough to be tested on it (even if our main global competitors do). If you’re going in post-secondary studies and reading this, my advice would be to realize that thanks to lip-service programs like this one (that probably took millions of dollars worth of studies to screw up) you have little knowledge about a very important topic. I would start by scanning this blog, and then giving yourself your own education about financial matters by following some of the commenter’s links, and looking at the other members of the Yakezie Network. This is how I received most of my financial education (along with reading books like the Wealthy Barber). I’m sorry if the tone of this post was a little cutting or jaded, it’s just that as a teacher I have to see kids waste tons of classes on topics they will never use, yet we don’t have time to put a decent personal finance course together and make it mandatory? Really? Maybe I’m alone in being this passionate about it, but when you look at the average debt levels across our nation (I’m definitely looking at you here post-secondary peeps) and how we are consistently setting new records every month, you have to wonder what it will take for the public education system to meaningfully respond with something concrete. What do our readers think? Am I just a little crazy this morning or are there some legitimate issues regarding financial literacy (maybe a bit of a both?). I believe that as a society we have to start educating our children on how personal finance, basic global economy, and capitalism all work. How else are they to compete with everyone else out there? Do we really want them to be meat for the consumer grinder? Good luck in fixing it BNL. As a public school employee I am strongly considering sending my children to a private school! I agree, I wasn’t a math wiz in high school at all, but I find financial math to be pretty straight forward. Even evaluating stocks is pretty straight forward once you understand what all the ratios mean and how a financial statement is setup. It’s all percentages and compounding. Learning how insurance works, or the basic concept of supply and demand is much easier than most people think it is. I really don’t understand the dragging feet on this one. Although I live in a state which now requires one semester of high school credit via a personal finance course, I don’t believe that will be enough. Parents and other family members still have an obligation to teach the next generation personal finance! That is one reason I have started a (hopefully) ongoing yearly week long ‘Money Camp’ for my grandchildren. I want to make sure they get more of a grounding in financial literacy than I did or than I provided to my own children. That’s very noble of you Marie! My hope that is if we engage kids when they’re young and show them the benefits of capitalism (ie. your money can grow while you do nothing) then they won’t find the subject so intimidating and boring when they hit high school. My husband and I have made it a priority to teach our kids about personal finance. 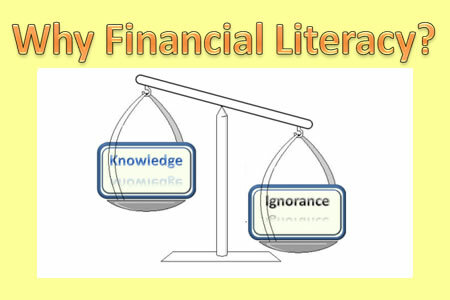 I consider financial literacy every bit as important as any academic topic – probably even more so. My parents and my husband’s parents were both instrumental in teaching each of us about money from a very young age – I’m so very glad they did since it allowed us to be on good financial footing at a young age. The way I look at it, is that financial literacy will allow me to provide for my family, and provide a maximum amount of leisure time for myself. In that leisure time I can concentrate on learning the other topics!